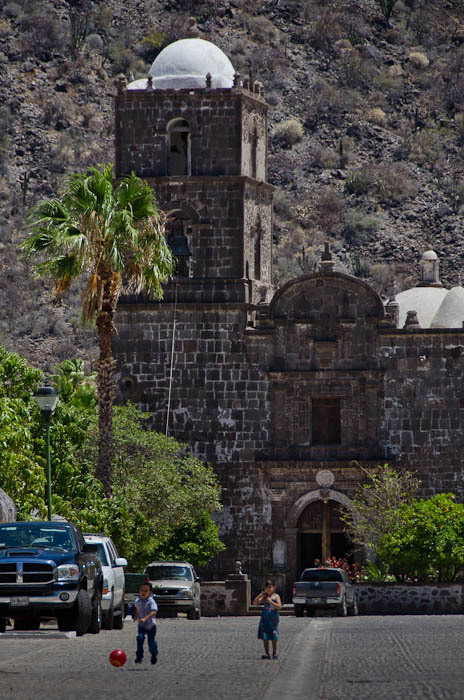 Mission San Javier is located on a long, winding road that twists through the hills above Loreto, Baja California Sur, Mexico. It was an bumpy drive at times, as several segments of the road had been washed out and were in the process of being rebuilt. That’s life in these arid parts of the world. It hadn’t rained for four years and when it finally came this past year, the runoff caused massive flooding. Water here is both a blessing and a curse. We made this trek to explore this most well-preserved of the Jesuit mission churches. Built in 1699, it’s one of the oldest in the Californias, and the best preserved, having survived several strong earthquakes. The tiny town that surrounds the church was what was most interesting to me. It’s still home to about 200 people that work in a few restaurants, an artisan’s collective and the fields beyond the mission that grow various vegetables, grapes they use to produce wine, and olives from some of the oldest olive trees in the Americas. I loved catching this little girl and boy chasing after their ball in the main street. On this trip, I was a guest of Villa del Palmar at the Islands of Loreto and was led on this tour by Roberto and Fausto from Wild Loreto Tours. Opinions are, of course, my own.